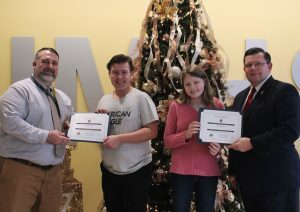 The Knights of Columbus John Marshall High School Students of the Month for November are Charli Garrison and Edward Huck. Freshman Charli Garrison appreciates that she has been recognized for her hard work. “I strive really hard to get straight A’s because I want to get in a good college. So I do my best to stay on task and just do whatever I’m asked.” Garrison also serves as a class officer for the 9th grade. John Marshall Student of the Month Edward Huck is filled with gratitude that he has been awarded as Student of the Month. “I think I deserve this award because I really try my hardest to have excellence in school. I keep good grades and have perfect attendance, and I just really wanted this.” Huck, who is also a freshman, is involved with Chorus and Monarch Company.